It was purely by accident; I had no intention of eating at another Frank Stitt restaurant. As far I as I knew it was The Highlands Bar & Grill, Bottega and Bottega Cafe, that was sum total of the Stitt Birmingham empire. So imagine my surprise when the hostess told me about Chez Fonfon. Let’s rewind and give a little background to this story. As usual, I was on the road to Atlanta and passing the time on I-20 by planning lunch. 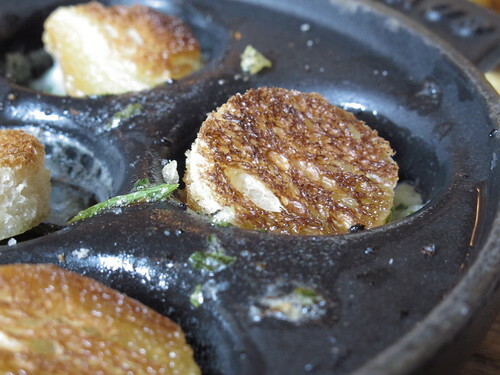 Of course, I had my list of new places to try but I wanted something that I was sure would deliver and in my brief experience with his restaurants, I knew that Stitt was up to the task. Knowing that data coverage was spotty, I called to make sure that Bottega was open past 2pm. The hostess confirmed that they and Chez Fonfon were open all afternoon. Chez Fonfon, I had never heard of such a place. The pleasantly loquacious hostess informed me that it was Chef Stitt’s take on the classic French bistro. Well, that’s all I needed to hear. I found the address, plugged it into google maps and made my way to the Five Points area of Birmingham. Inside Chef Fonfon, it’s a fairly accurate representation of your picture perfect bistro. There may not be the darkened ceilings from decades of cigarette smoke and you’re more likely to hear Spanish from a waitress than French, a more Sur La Table French bistro than the lost generation but it’s still a pleasant place to be. 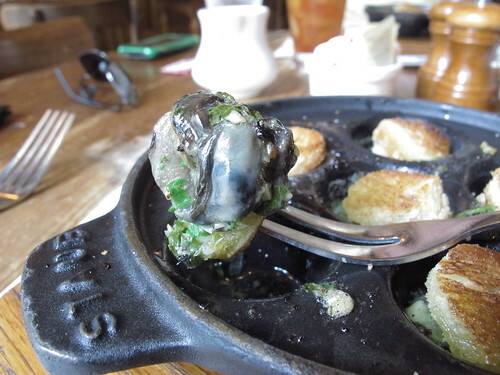 However, I didn’t take the long way around Birmingham to discuss architecture and appointments; I came for the food, the French food and that means starting with the most stereotypical French dish of all, escargot. 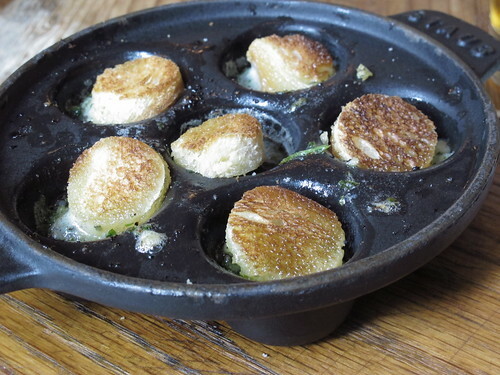 That may sound like I’m belittling the classic appetizer and that couldn’t be farther from the truth especially when the snails come with parsley and shallot butter. Toasted rounds of bread do their best to soak up the butter, but there’s just too much richness for one piece of bread to contain. 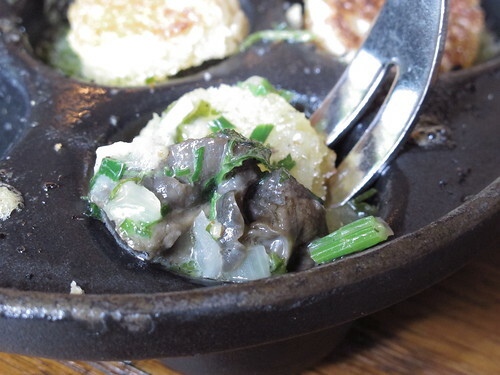 It was initially upsetting to see garlic absent from this plate of escargot, but its fellow allium, the shallot, worked beautifully. If only every meal began this well. 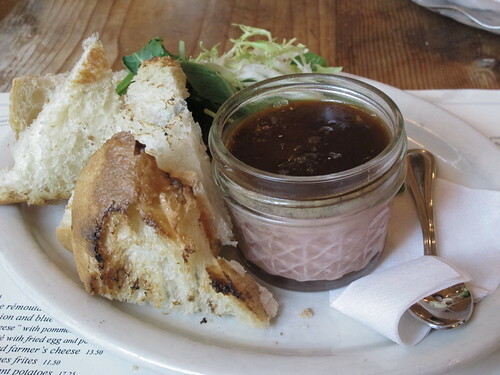 Despite the temptations of a crawfish gratin, steak tartare, and a charcuterie platter from the appetizer section and the trout, moules frites, and steak frites from the entrees, I stuck to my guns and tried Stitt’s version of chicken liver mousse. Accompanied by a few torn pieces of bread and a small, side salad, this Madeira aspic topped mousse was even more satisfying than the escargot. 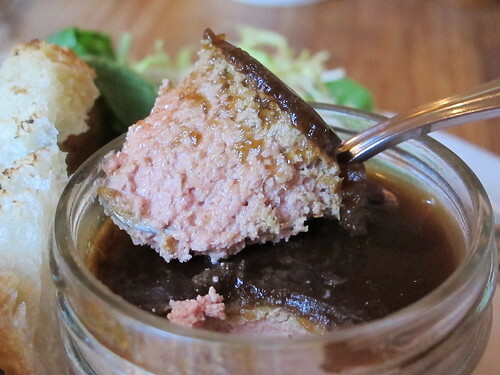 With each spoonful of mousse, it was a dizzying combination of rich chicken liver and the complimentary, almost caramelized depth of the Madeira aspic. Chalky, overcooked liver, the bane of every good pate, mousse, and mousseline was completely absent. The only real downside to the mousse was not enough bread, but that problem was quickly remedied by the waitress. While I thoroughly enjoyed the escargot and mousse that I had ordered, I couldn’t help but notice the people around me. It seems as if everyone else in the restaurant had ordered the Hamburger Fonfon and they were loving it. By the time I departed, every burger was gone, not a scrap was left. Those clean plates were a solid endorsement and a few weeks later, when I was passing through Birmingham again, I stopped at Chez Fonfon to try the Hamburger Fonfon for myself. 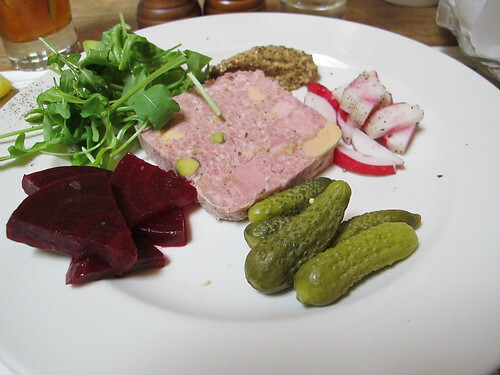 However, before I settled down for a burger, I decided to see about another piece of charcuterie, the country pate with pork, ham, foie gras and pistachios. Like the chicken liver mousse, this was an excellent piece of charcuterie. A dense mixture of ham, pork, foie gras, and pistachios meant every piece was as rich, moist, and meaty as you’d expect. As well planned as any charcuterie plate, there was a full range of vinegar laced, tangy delectables to combat the richness of the pate. 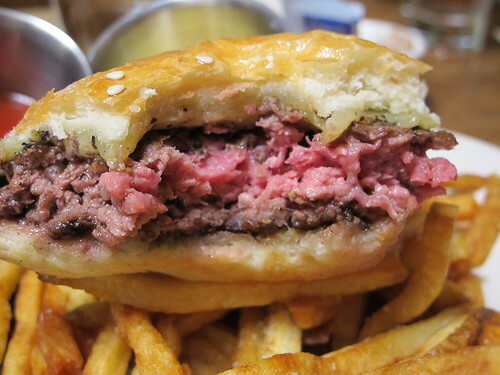 Enough about the pate, it was time to see if the Hamburger Fonfon was up to par. Was it as good as everyone made it seem or were people fawning over dreck? 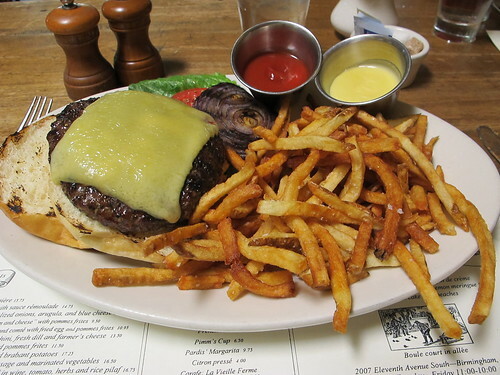 A hamburger topped with comte cheese, a small mountain of salted French fries, and a choice of ketchup or Dijon aioli, what more could you ask for? 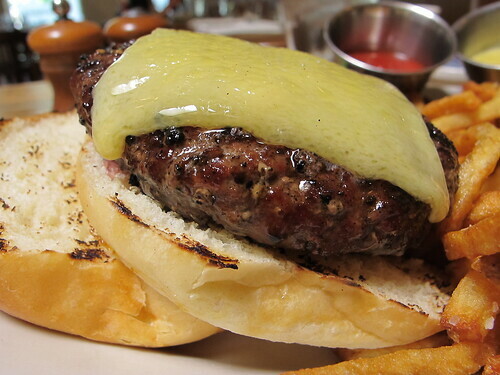 Made from the kitchen’s steak trimmings, the Hamburger Fonfon was a stab at hamburger perfection. There was a well seasoned crust that concealed a river of greasy, beefy juices. The first bite opened the floodgates for juiciness and each subsequent bite revealed a heavily seared crust with an amazing medium rare interior. House ground beef of high quality trimmings, simple salt and pepper seasoning, a toasted bun, and an ever so slightly strong slice of melted comte cheese, the Hamburger Fonfon was a slice of cheeseburger nirvana. Not wanting to overshadow their bovine neighbor, the French fries at Chez Fonfon are superb in their own right. 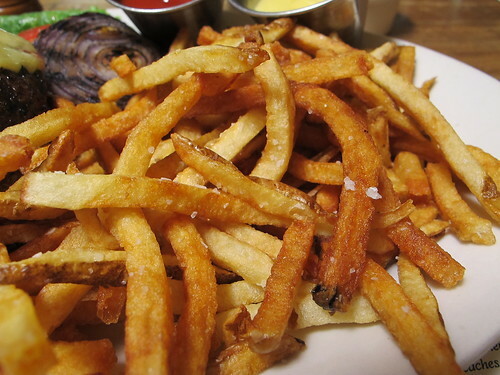 Delightfully crunchy, perfectly salted, and well suited to both the ketchup and aioli, it was impossible to resist these French fries. When combined with the Hamburger Fonfon, it was a near indomitable combination. No wonder that the Hamburger Fonfon is such a popular dish. In addition to the previously mentioned four dishes, I had the opportunity to try a bite of the trout with brown butter and I’m happy to say it stands shoulder to shoulder with the rest. As is the case with non-local restaurants, I may have just scratched the surface of what Chez Fonfon has to offer, but I have yet to be disappointed in a Frank Stitt restaurant. 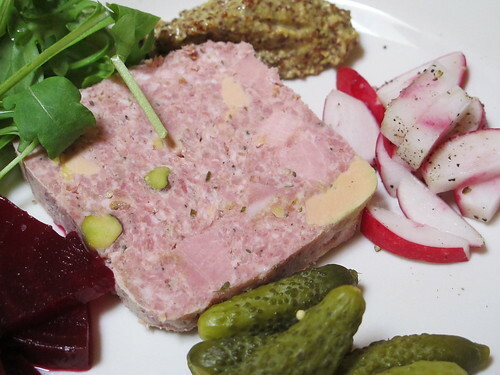 With its simple, seasonal menu, welcoming atmosphere, and extremely helpful wait staff, Chez Fonfon plays the role of French bistro to a t. Is it authentic? If the food is this good,I don’t really care, authenticity be damned. that hamburger...my god. i've never been so jealous of your eating adventures.